Backdrop to many of the highlights of Greek mythology, the beauty of the Peloponnese region has not been spoilt by the years. 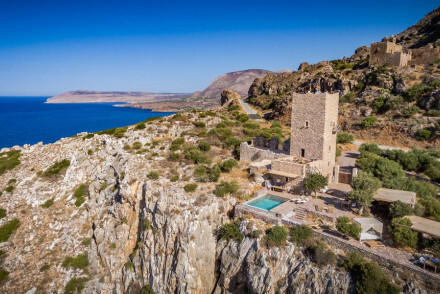 For many visitors the construction of now ruined Mycenaean palaces, Roman theatres, Venetian fortresses and Byzantine churches has added to the appeal and our recommendations for the best places to stay in the Peloponnese are all great bases from which to explore this region. In addition you'll find that most are also within easy reach of the perfect sandy coves and rugged, cypress covered coastlines. Originally the Peloponnese peninsula was part of mainland Greece, but it's been cut off by the Corinth Canal. This is a large region, but however long you have to spend here you'll probably finding yourself not being quite ready to leave. The modern town of Olympia is only 500metres from the ancient one, sight of the first Olympics and their home for a millennium. This lush, green sanctuary is one of the most popular sights on a tour of the ancient Peloponnese world. Closely followed by Byzantine cliffside town, Mystra. Once home to 20,000 people, this was the last refuge of the Byzantine empire after they took it from the Franks in the 13th Century. Wandering these streets is like travelling back in time, as gates, palaces, churches, frescos and tiny details of everyday life have survived here. But of course visitors won't want to miss the palaces of Agamemnon at Mycenae, the palaces of Nestor at Pylos and the Greek theatre at Epidaurus. As well as the beautiful coastline, this region also has mountains high enough to get enough snow for some decent skiing, some dramatic gorges cutting up the landscape of citrus orchards and vineyards, and countryside just begging to be hiked through. The mountains of Arkadia, still relatively wild and unspoiled, are a wonderful place to explore on foot, as is the Mani Peninsula. Nafplio or Nauplia was the first modern capital of Greece, a romantic looking town of elegant Venetian houses lining narrow streets. Its location is romantic too, beneath the Palamidi Fortress, a vast citadel built on top of an outcrop of rock 200ms above Nauplia's port. The fortress is just the literal tip of the historic points of interest here. Nauplia is an ancient town, with numerous museums, several smaller forts, and some charming churches. On a tiny island 200m off the east coast of the Peloponnese, Monemvasia is best known for the spectacular castle fortress which sits atop an impressive plateau rising sharply out of the sea. 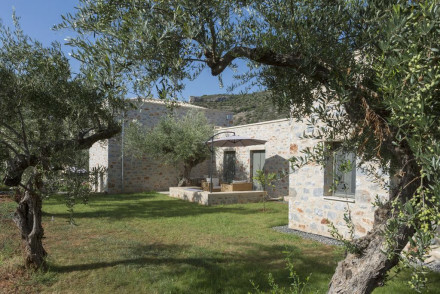 This is one of the best places to stay in the Peloponnese for folks with an interest in history. As well as the town's medieval walls there are also several Byzantine churches and, of course, the castle. The town's winding medieval streets and alleyways are only fit for pedestrians, so this is a quiet spot. Away from all the historical sights the peninsula also boasts fabulous beaches. Many of the best places for beach lovers are in the Messenia region where there are luxury eco developments and golf and beach resorts popping up. There are also plenty of wonderful little villages and seaside towns in this largely agricultural region. The capital, Kalamata, is famed for olives, it has a new marina and stylish new seafront development. Visit the ancient town of Olympia. Travel back in time whilst strolling through the historic Byzantine cliffside town of Mystra. Marvel at the palaces of Agamemnon and Nestor and the Greek theatre at Epidaurus. Hike along picturesque trails in the rugged mountains. Unwind on the picture perfect beaches. Explore the forts and citadel of Nafplio. 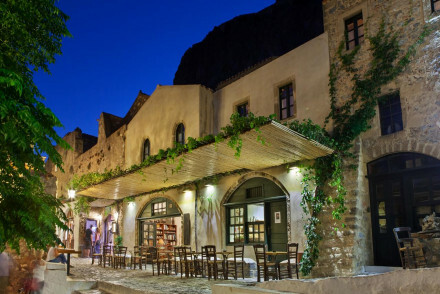 Discover the tiny island of Monemvasia, rich in historical sights. 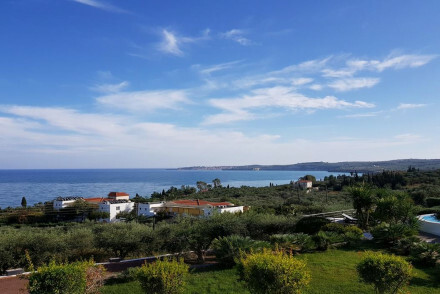 Such a beautiful area with so much to see means that many of the best places to stay in the Peloponnese are quickly snapped up during peak season, so make your plans and book early. If you're looking for a good value base which offers excellent local recommendations then the Hotel Byron in Nafplio is perfect. This townhouse has been converted from an ancient building right in the heart of the old town. If you get one of the balcony rooms you'll have a wonderful view of the rest of the town and the sea. With rooms starting from €73 per night, this is perfect for those on a budget. 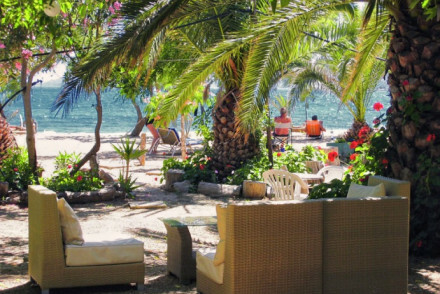 Zoes Resort is a great value hotel on the beach in a lovely village. Simply decorated rooms and apartments have sea-facing balconies and extra beds. Rustic Greek restaurant and terrace, pool, and immediate access to the beach. 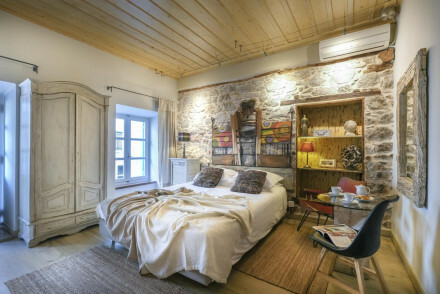 Mazaraki Guesthouse is a chic and charming traditionally built B&B, overlooking the vast Laconian Plain. Rooms are surrounded by lush greenery and offer achingly pretty interiors, fireplaces, kitchens and superb views of the Byzantine castle of Mystras. Citta dei Nicliani is a hidden gem in the Mani Peninsula. The ancient building has been lovingly restored and offers spacious rooms with exposed stone and wood, and antique furnishings. 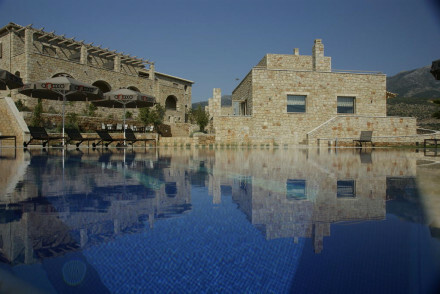 Petra and Fos Boutique Hotel and Spa is a magnificent traditional stone-built hotel on the dramatic southern cliff of Mt. Taigetos. Brimming with authenticity, the elegant rooms feature beautiful exposed stone walls and wooden beamed ceilings. 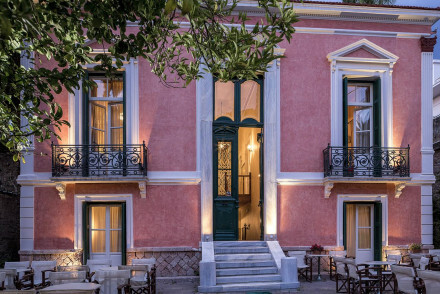 Aetoma Hotel is a charming 'neoclassical' pension in an 18th century mansion in the old Venetian town of Nafplio with wonderful sea views. An excellent base for exploring ancient Greek sites in the Peloponnese. 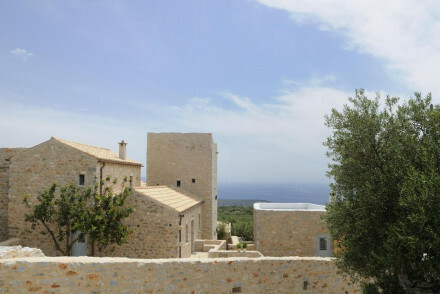 Pirgos Mavromichali is a traditional tower building in a lovely village above a fishing cove. Traditional chic rooms have parquet floors and stone walls. Kyrimai House Hotel is a rustic chic hotel with zen spaces and an award-winning restaurant. Beautiful rooms and suites have polished wooden floors, sophisticate neutral furnishings, hot tubs, and balconies. Five Star luxury on a beautiful olive and wine estate. Kinsterna Hotel and Spa is a traditional building with romantic terraces stepped into the valley, each with pools and relaxation areas. Sumptuous rooms and suites are chic and understated. 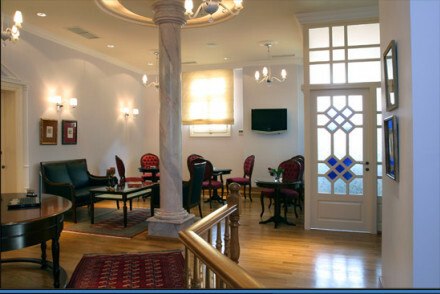 Nafplia Palace is a highly luxurious hotel in a beautiful setting. 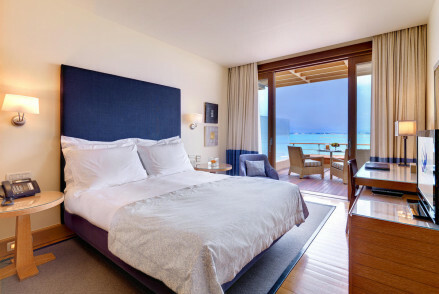 Sea-facing rooms and suites in contemporary style with private balconies, all the mod cons and private pools. Two excellent restaurants, pool, and private beach. 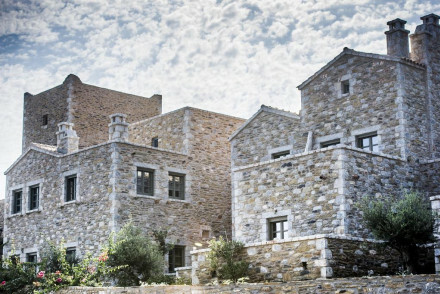 Find flawless luxury in the Peloponnese at Amanzo'e. This magnificent Aman hotel comes with signature jaw-dropping villas with private pools and fabulous views. Private beach club, Aman spa. Smyros Resort is off the beaten track a bit, and one of the best places to stay in the Peloponnese if you want to get away to somewhere sleepy and relaxing. There's no beach here, but there's rocky access to the sea, and spectacular sea views. Accommodation is simple and traditional, as is the very welcoming welcome. Reasonably priced rooms and family suites mean this is also one of our top choices for families. Enalio Suites is a lovely practical hotel on the beach front. Modern suites with sea-facing balconies (some sleep 4) have kitchenettes and all the mod cons. Excellent pool and lounge area, and a stone's throw from the beach and surrounding sights. Nikki Beach Resort and Spa is a sleek beach side hotel with chic contemporary interiors and white on white design throughout. The rooms boast epic sea views from the floor to ceiling windows. With a choice of four restaurants and lounges to suit all occasions and an expansive spa and infinity pool to aid total relaxation. Kalamitsi Hotel is a lovely hotel in a beautiful location. Orchards and olive groves lead down to the beach. A selection of rooms, family bungalows, and suites with kitchenettes cater to families and groups. Contemporary, minimal monastic-looking hotel set in six acres, with panoramic views of Mount Melon. Seleni Suites offers thirty stylish suites, good facilities and a children's playroom. A good base for an outdoor, active family holiday. The Peloponnese peninsula has no major airport, the nearest airport is Athens which is well served internationally. Travel by car, bus or train from Athens to Peloponnese. The region is very hot in July and August. Plan a trip for September when the crowds will have abated and the sun has cooled a little. 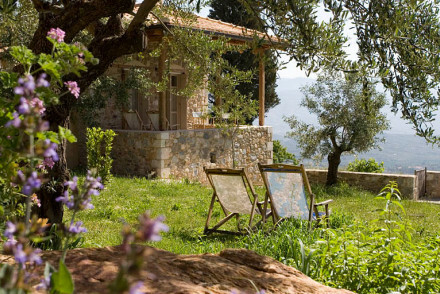 Browse through our list of all the best places to stay in the Peloponnese. Alternatively, expand your search to see all our recommendations in the Ionian Islands. Call or email one of our gurus for advice. 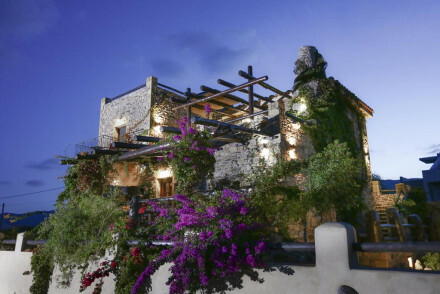 A chic guesthouse located in the historic Castle of Monemvasia. 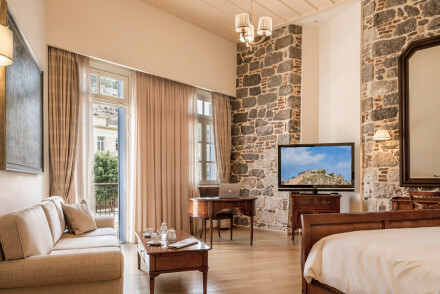 Individually styled rooms are packed full of charm with exposed stone walls, beamed ceilings and antique furniture. Indulgent breakfasts are served and wine and olive oil tasting can be arranged on site. 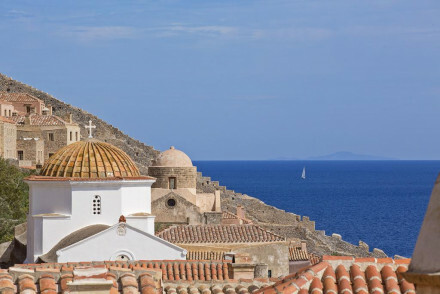 Local exploring - From days by the sea to cultural attractions, Monemvasia has a host of activities to offer. 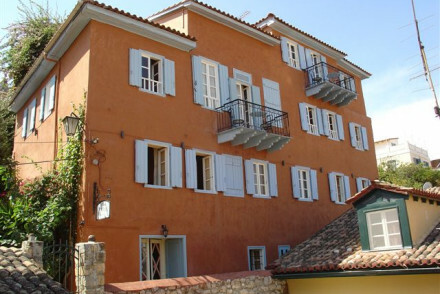 This charming traditional guesthouse is located in the pretty village of Dimitsana. Suites have exposed stone walls and wood panelled ceilings, with luxurious linens and locally sourced timber furniture. Enjoy beautiful views over the mountains or relax by the cosy fireplace. An idyllic retreat. A great value hotel on the beach in a lovely village. Simply decorated rooms and apartments have sea-facing balconies and extra beds. Rustic Greek restaurant and terrace, pool, and immediate access to the beach. Ideal for families, groups and those on a budget. Groups - 3 bed rooms. Hidden gem in the Mani Peninsula. The ancient building has been lovingly restored and offers spacious rooms with exposed stone and wood, and antique furnishings. Delicious dinners are created from the freshest local ingredients. A perfect and romantic hideaway for experiencing authentic Greece. 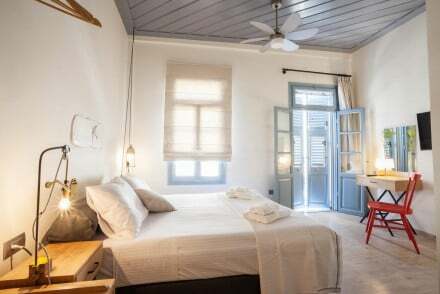 Traditional Greek guesthouse with just two rooms and two suites. All rooms have private bathrooms, exposed stonework, soft hues, crisp white linen and the best have balconies. Indulgent breakfasts are served and there's an small atmospheric bar for an evening tipple. 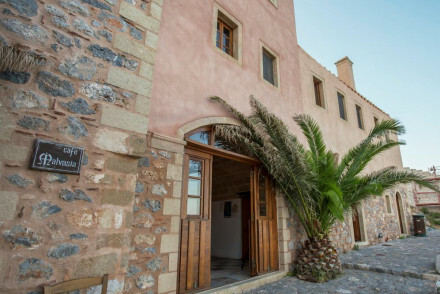 A charming boutique property in the centre of the historic town of Monemvasia. A handful of rooms are uniformly styled with whitewashed walls, beamed ceilings, light wooden furniture and the best have a private terrace. An ideal base from which to explore the cultural attractions of the town. 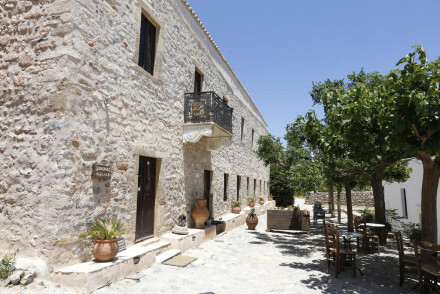 Local exploring - Located in the heart of Monemvasia with many of its sites within walking distance. Sights nearby - Visit the church of Ayia Sofia in the upper city, perched on the cliffs. A rustic chic hotel with zen spaces and an award-winning restaurant. Beautiful rooms and suites have polished wooden floors, sophisticate neutral furnishings, hot tubs, and balconies. 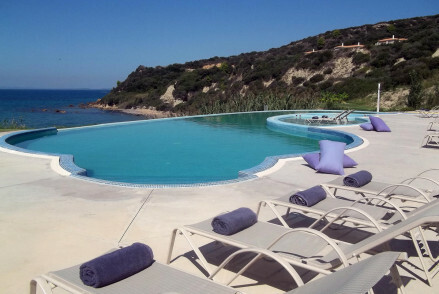 Excellent Mediterranean cuisine, pool, and the delights of the Ionian sea for beach life. Romantic, gourmet. A traditional tower building in a lovely village above a fishing cove. Traditional chic rooms have parquet floors and stone walls. Lovely terraces and views out to sea. An excellent restaurant and lots to discover. An understated spot with a great history behind it. Views - Magical views of both the sea and mountains. 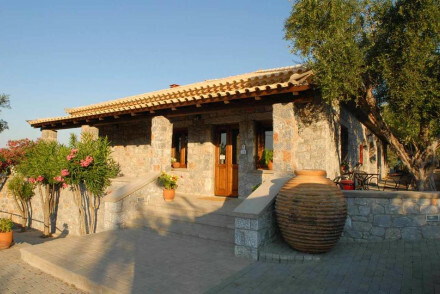 A chic and charming traditionally built B&B, overlooking the vast Laconian Plain. 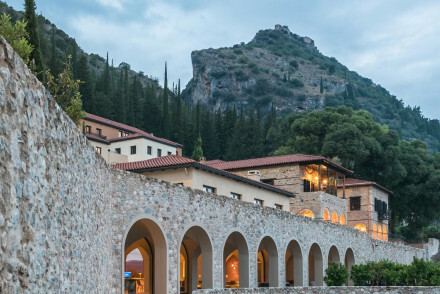 Rooms are surrounded by lush greenery and offer achingly pretty interiors, fireplaces, kitchens, and superb views of the Byzantine castle of Mystras. The homely and informal atmosphere is contagious. Local exploring - Surrounded by stunning mountains and medieval ruins, this hotel is a great base if you want to explore the countryside. Total relaxation - It is the perfect place to sit back, relax and unwind for a few days, guests have the option to read, swim or explore. 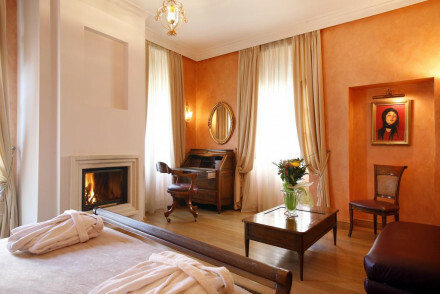 Romantic Break - Cosy rooms with a kitchenette and fireplaces, offering wonderful views from its private balconies. Writing a novel - Be inspired by the peacefulness and superb views, plus writing desks are provided. A sleek and modern resort with a traditional Greek twist, heart-wrenching views of the mountains or sea and spacious rooms and suites with light, minimalist decor. There is a pool, bar and garden that's ideal for reading in the shade of the golden sun. 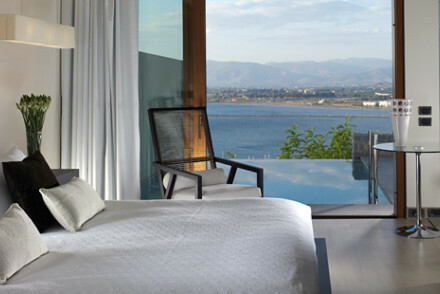 A five star property beside a beautiful stretch of beach in the vibrant city of Kalamata. Contemporary rooms are spacious and light with plenty of glass and a white on white palette. A poolside restaurant serves up exemplary Mediterranean fare and there's a spoiling spa too. Beach Life - A luxurious resort based on a beautiful stretch of beach. Sights nearby - Visit the magnificent remains of Ancient Messene. A lovely practical hotel on the beach front. Modern suites with sea-facing balconies (some sleep 4) have kitchenettes and all the mod cons. Excellent pool and lounge area, and a stone's throw from the beach and surrounding sights. Ideal for families. Sights nearby - Close to ancient Corinth, ancient Mycenae, Nafplio and much more! Atmospheric property with superb sea views in a romantic, off the beaten track location. The resort is crafted from traditional stone and offers simple yet chic accommodation. There is no beach, but you can access the sea from the rocks and there is a large outdoor pool. A lovely hotel in a beautiful location. Orchards and olive groves lead down to the beach. A selection of rooms, family bungalows, and suites with kitchenettes cater to families, groups and couples. Charming terraces and restaurant. A tranquil spot. Garden - Lovely orchards and olive groves. Cosy and spacious modern studios and apartments situated a stone's throw away from a secluded beach. In-house services include a Crossfit gym, a cafe and hiking tours around the area. All rooms come with private terraces, fully-equipped kitchens, satellite TV and a safety deposit box. A striking grey-stone building boasting a tranquil and beautiful rural location. 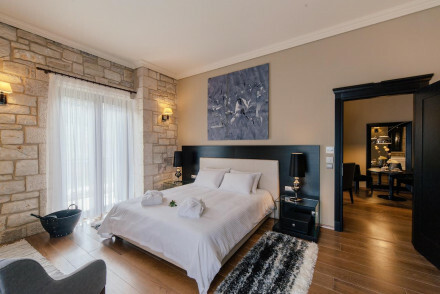 Inside, rooms are spacious and mix traditional and modern styles with exposed stone walls, beamed ceilings, whitewashed walls and simple minimalist furniture. A serene base from which to explore the region. 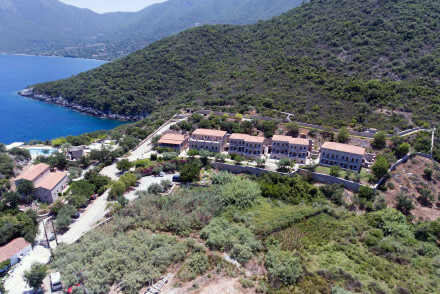 Local exploring - Boasting a quiet location but within easy reach of the beaches and cultural attractions of Mani. Sights nearby - Explore the historic castle town of Vatheia. A charming country house boasting fabulous sea views. Traditionally dressed rooms are cosy and characterful with whitewashed walls, dark wooden furniture, exposed beam ceilings and private balconies. Indulgent breakfasts are served on the terrace and there's an array of activities in the region. Local exploring - A tranquil base from which to discover the region's natural and cultural attractions. 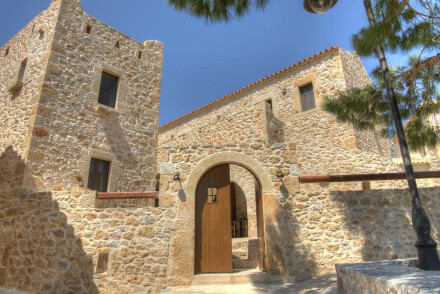 Sights nearby - Visit the majestic Castle of Monemvasia. 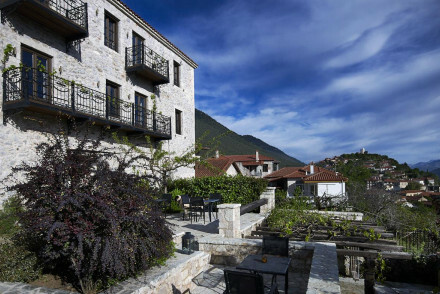 This four-star art hotel is located in the mountain village of Vytina. 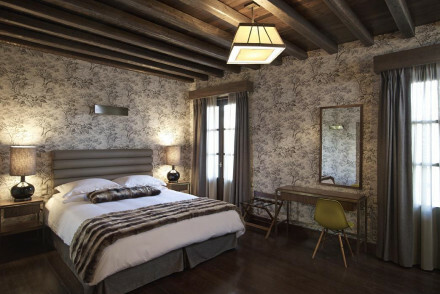 Rooms have modern furnishings and exposed wooden beams. The décor's earthy palette nods to the natural surroundings; the best rooms have a balcony with views of the beautiful landscape and pool. A contemporary mountain bolt-hole. 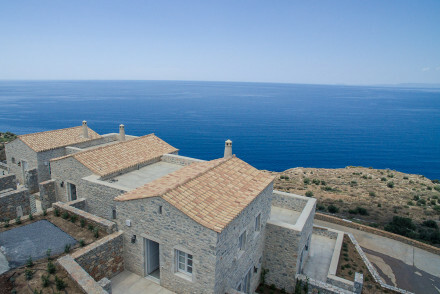 A luxury property boasting a secluded and beautiful location in the region of Mani. Rooms are contemporary with luxurious bathrooms, crisp white linen, plush headboards, beamed ceilings. A superb restaurant. Spend days on the beach, trekking the countryside or discovering the local historic sites. Local exploring - From beaches to historical sights there's plenty to see and do in the area. 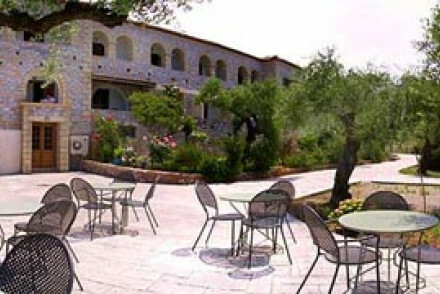 Contemporary, minimal monastic-looking hotel set in six acres, with panoramic views of Mount Melon. Thirty stylish suites, good facilities and a children's playroom. A good base for an outdoor, active family holiday. Wonderful walks and archaeological sites to explore. A magnificent traditional stone-built hotel, on the dramatic southern cliff of Mt. Taigetos. 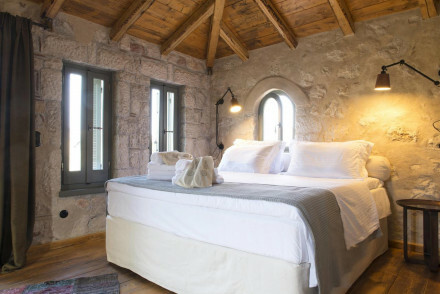 Brimming with authenticity, the elegant rooms feature beautiful exposed stone walls and wooden beamed ceilings. Relax by the pool and absorb the stunning panoramas of the gulf of Itilo. A coastal wonder. Hideaway - The secluded cliff-side setting and charming rooms, make for a perfect romantic escape. Fishing - Head out on a deep sea fishing adventure and explore the cost from another perspective. Sights nearby - Visit the nearby Caves of Diros. 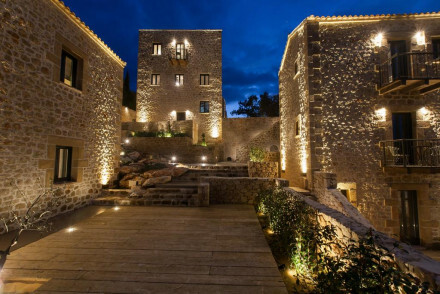 This boutique hotel is set within Monemvasia Castle, on an island off the coast of the Peloponnese. Suites are dressed with antique furniture and a regal palette in keeping with the hotel's heritage; the best have a balcony and sea views. Enjoy a coffee al fresco at the hotel café. A unique getaway. 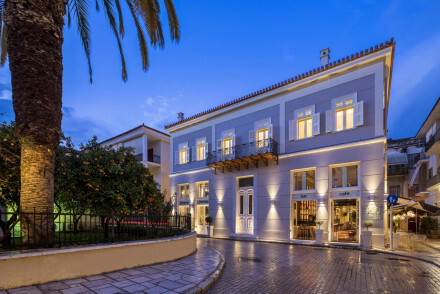 This hotel is nestled on a farm in Nafplio and offers luxury self-contained country houses and private rooms. The detached properties have self-catering facilities and ample living space; expect rustic fittings and exposed stone walls. Relax by the outdoor pool or with a massage. A rural delight. A beautifully restored rural property set in beautiful and secluded countryside. Rooms are traditional yet chic with exposed stone, beamed ceiling and crisp white linen. A tranquil spot from which to explore this fascinating region. Country Escape - A quiet rural escape with access to beautiful countryside and the sea. Sights nearby - Visit the spectacular Diros caves. This four-star hotel sits at the foot on Mount Mainalon in central Arcadia. 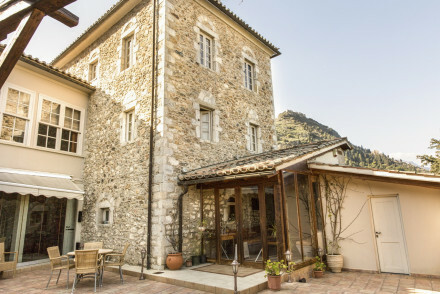 Suites have exposed stone walls and wooden beams; the best offer a cosy fireplace and split-level living space. There is one specially adapted suite with ramp access. Keep active with free gym use; a modern mountain retreat. Active Holiday - With a ski school attached to the hotel, there's no excuse not to hit the slopes! An idyllic beach sanctuary comprising of stylish self-catering cottages (for two) on the Aegean Sea. Set in lush gardens the cottages have a paired down style with a hint of Asian design. A large sea facing pool is the perfect spot to while away a few quiet hours and there's a charming bar too. 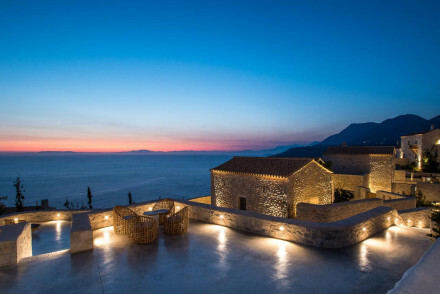 This four-star luxury hotel and spa is located in Mani, on the southernmost tip of Greece. Built using local materials and in the traditional style, suites boast exposed stone walls and ample living space dressed in earthy tones; the best offer a terrace and fireplace. A refined seafront estate. 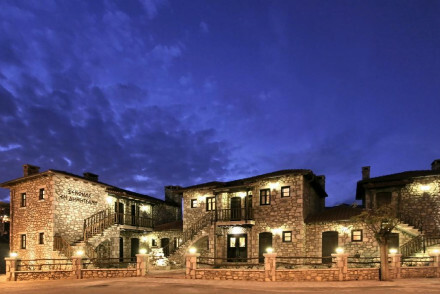 This luxury resort and spa is located in the idyllic mountain village of Trikala. Spacious suites have private entrances and ample living space, as well as traditional exposed stone walls and wooden beams. 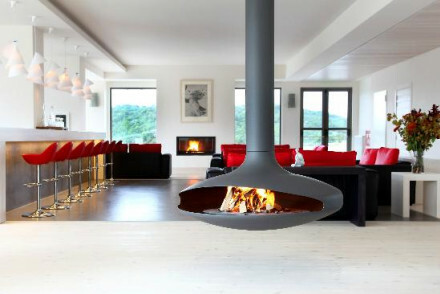 Relax by your cosy fireplace before dining at the modern restaurant. An inviting bolt-hole. A boutique property boasting a unique location inside a Byzantine citadel. 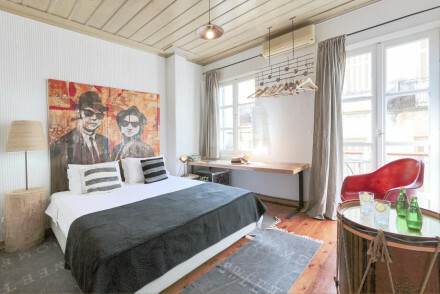 Beautifully refurbished rooms keep the building's original charm, showing exposed beams and stonework, while having a clean contemporary feel. Sunny terraces enjoy spectacular sea views and there's a fabulous restaurant too. Local exploring - Being located in the heart of a Byzantine castle citadel means there's plenty to explore. 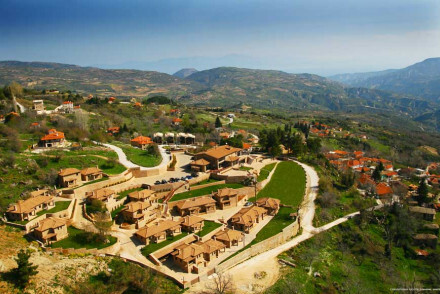 Sights nearby - Make a trip to fascinating Mystras a Byzantine, a UNESCO World Heritage Site. Sailing - Spend a day exploring the coastline from the sea. A pretty mountain retreat with epic views. Charmingly rustic with wooden beams, exposed brick walls, open fires and wood paneling. Rooms are pleasant and homely with wooden bedsteads and cosy extra blankets. The restaurant on site serves delicious local fare, and an outdoor jacuzzi seals the deal! 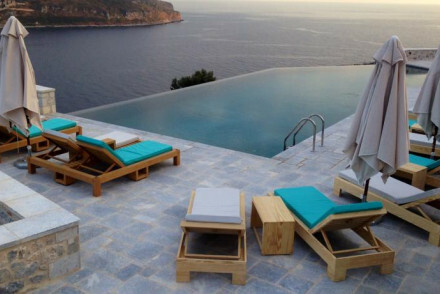 This charming seafront hotel is nestled on a hill in Elis, in the Peloponnese region. Bright and airy suites have simple, modern interior design; the best rooms offer a panoramic view of the sea from a huge window. The self-contained villas are great for families. A unique Mediterranean bolt-hole. Four newly built villas blending perfectly into their rural surrounds. Mixing local stone, plenty of glass and clean design the properties are chic and modern yet have an authentic feel. Featuring uber modern kitchens, plenty of shady areas to dine in private and a glorious pool. Families - The individual villas and self-catering facilities make this an ideal option for families. Sights nearby - Visit Beaufort Castle which was the Acropolis of the ancient city of Lefktron. Five Star luxury on a beautiful olive and wine estate. A traditional building with romantic terraces stepped into the valley, each with pools and relaxation areas. Sumptuous rooms and suites are chic and understated. Excellent restaurant, beautiful views. Dreamy. Garden - The estate produces its own crop of wine and olive oil. 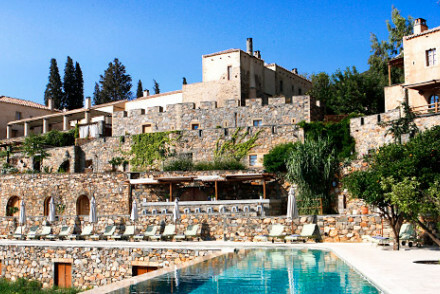 This luxury hotel is housed in a renovated 19th-century mansion in Mystras. The building's heritage shines through in the regal linens and warm, natural tones of the rooms; the best suites offer a separate living space. Stroll through the beautiful orange grove and terrace; a pretty period hotel. A small hotel set perched atop a cliff boasting spectacular sea views. Converted by the architect owners this three bedroom property exudes style and luxury from the beautifully created sun loungers, stylish cavern-like rooms and superb restaurant. Ideal for a quiet retreat away from the crowds. Total relaxation - A tranquil and luxurious clifftop escape. Sights nearby - Visit the small archaeological site at Cape Tainaron. 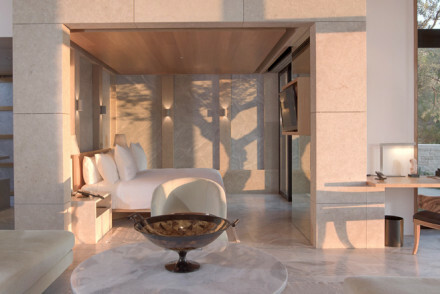 A sleek beach side hotel with chic contemporary interiors and white on white design throughout. The rooms boast epic sea views from the floor to ceiling windows. With a choice of four restaurants and lounges to suit all occasions and an expansive spa and infinity pool to aid total relaxation. Bliss. Beach Life - Situated directly on a beautiful white sand beach, with stunning coastal views and excellent seafood. Local markets - Explore the local markets of Porto Heli and pick up some regional treats. Great walks - Take long walks through the rugged countryside and along the epic coast. Sailing - The hotel dock provides anchorage for yachts of all sizes. A beautiful stone hotel with garden, terraces and stunning views of the sea, mountains and valleys. Rooms are stylish yet homely, with exposed beams, natural materials and tiled floors contrasted with contemporary furnishings. To top it off, a delicious traditional Greek breakfast is served. Superb! This five-star luxury hotel sits within a beautiful olive grove overlooking the Messinian Gulf. Guests are welcomed to bright suites dressed in an earthy palette; there's an added hint of nature with an olive plant in each room. Relax on the hotel's sandy beach or in the infinity pool. A VIP resort. An impressive spa retreat inspired by Byzantine design nestled in a densely forested mountainside. Choose from a wide range of treatments, unwind in the pools or languor in the woodland jacuzzi. Benefit from the balanced diet and general spiritual serenity. A truly spoiling stay. 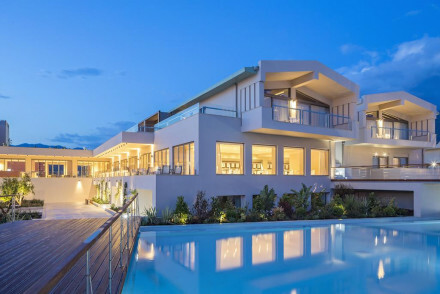 This four-star luxury accommodation is nestled on the coast of southern Greece. 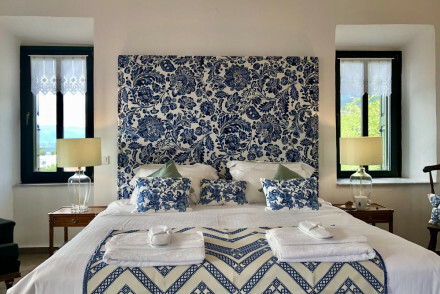 The complex is built in the traditional style and has exposed stone walls; the best of the self-contained villas boast four-poster beds, ample living space and a jacuzzi. Dine on the outdoor terrace; an elegant resort. Flawless luxury in the Peloponnese. This magnificent Aman hotel comes with signature jaw-dropping villas with private pools and fabulous views. Private beach club, Aman spa. Heaven on earth for discerning guests and families who like a balance of total privacy and Five Star hotel facilities.